A combination of falling Deposit Rates, Tax changes along with Rising property prices and rents are causing some investors to consider using their pension funds to buy properties. Because of the generous tax exemptions within a pension fund, investors can often get a much better return than purchasing the property personally. There is no income tax, PRSI, USC on rental income or no capital gains tax (CGT) liability on disposal, if the property is held with a pension fund. The Self-employed and company directors have a particular advantage as they can set up a self-administered pension which gives them more control over the costs of managing both the fund and the property. Generally, the minimum amount for setting up a self-administered pension is about €150,000 in investment funds. This would incur a once off set-up fee for the establishment of the fund. In addition, self-administered pension funds are required to provide annual valuations, this will would incur a further annual trustee fee which may be reflected as a % of the overall fund. Some restrictions do apply in terms of how you buy and sell and property with a pension fund. As per Revenue rules, the property must be held at “arms length”, in other words, the fund can’t buy your home from you, nor can the fund buy the property for your own personal use, nor can you sell it to close relatives. Post Retirement, It may also be possible to transfer the property from a self-administered pension to a self-administered ARF and thus continue to generate a post retirement income. For Company Directors with surplus cash on their balance sheet, self-administered pension funds can also prove more tax efficient than investing through a company – despite the low corporation tax on company profits. If the property is bought through the private company, there will be corporation tax on rent received (as well as a close company surcharge). In addition, there will potentially be corporation tax on chargeable gains if the property is sold, although this would not apply to property bought in 2014 and held for seven years. In addition, purchasing an investment property in a company can adversely impact on the availability of CGT retirement reliefs and Capital Acquisitions Tax (CAT) business property relief down the line. Assuming there is sufficient liquidity in the fund, on retirement, 25 per cent of the pension can be taken tax-free. In addition, the property could then be transferred directly to a self-administered ARF and could continue to generate a post retirement income. When stamp duty, and other purchasing costs are included, the total cost is €255,000. Now after property tax and letting agent’s fees, the rental income is €13,915 a year. For a pension fund investor the rental yield would be 4.36%, which is more than double the return for an ordinary private investor who could pay up to 41% income tax as well as 11% in PRSI and USC. A personal Investor will also have to pay CGT on its sale, which would further reduce the value of the investment when the property is being sold. 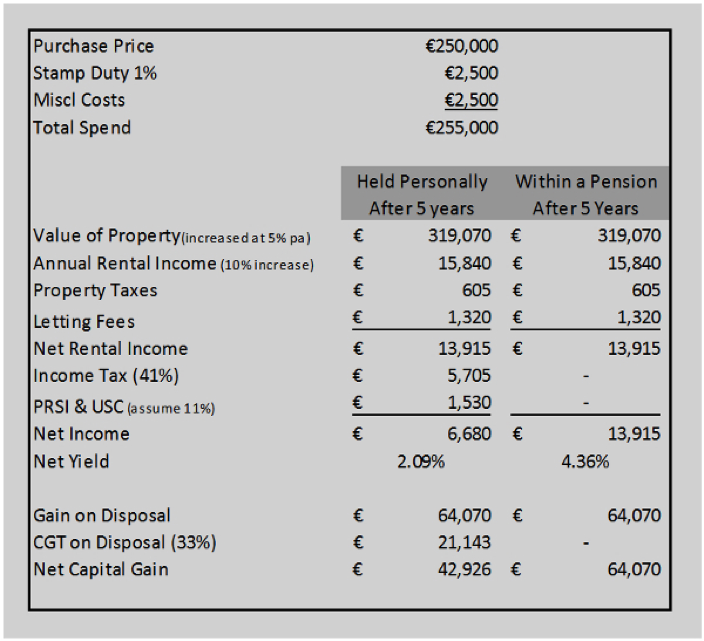 In this example, as the personal investor would pay 33% CGT on this gain, that would reduce their net gain to €42,926 – well below the €64,070 achieved by the pension fund, which does not pay CGT. We must also take into account that when the pensioner draws out income from their pension fund he or she is liable to income tax on their annual other income from the fund. Then there are also pension levies: 0.75% in 2014 on pension fund assets this year reducing to 0.15% next year. There can also be extra administrative costs involved in purchasing through a pension and extra management costs if a professional is hired to manage the tenancy. Of course the levy and pensioner income tax would apply even if it was not invested in property. An additional advantage of pension investment is that while investing in property a pension can have the cashflow advantage of using the funds saved from CGT to buy more valuable property, and thus further increase the value of the pension. Contact Declan Maher on 087 1444977 or at info@declanmaherfs.ie if you would like to find out more.